I began the year 2016 preparing my motorcycle to new adventures to be achieved when doing rides and trips along the next months. In order to get a better performance of my bike's engine I acquired and installed a kit containing an I-Booster and a spark plug NGK Iridium Dr8eix (Made in Japan); I am intending to get essentially less fuel consumption, a more stable electric discharge to the spark plug and thus a better overall engine output. I have been researching about the subject for a while and I finally decided to install the kit. Along the next months I will be testing and reporting about such kit in this page. Installing the Kit Ibooster F3 plus spark plug NGK Iridium Dr8eix (Made in Japan) in mine Sundown STX Motard on the morning of the 2nd of January, 2016. On the 24th of January, 2016 I went on a short ride of around 200 km with my friend Mauro Gomes to a spot near the urban area of São Miguel do Passa Quatro - GO. There is an interesting leisure area, in a private property, by the river margin. Poço da Pedra is a natural well on a stretch of the river where the bottom and margins are sit on a rocky formation. The owner of the farm where the natural attraction is located built the basic structure to allow visitors to enjoy the river and Nature around there. Those short trips and rides suit to meet our friends, as well as to put our motorcycles on the road while the big trips are planned. 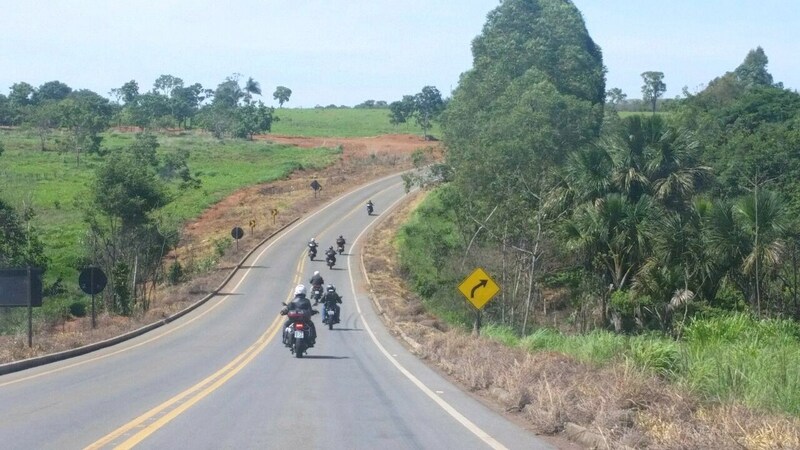 In this way on the 20th of March, 2016 we did a short ride passing through Trindade - GO, lunch at the margin of BR-060 road in Posselândia - GO, going to Palmeiras de Goiás and returning to Goiânia - GO via GO-060 road. We really value each one of those opportunities! Due to the beautiful weather of April our group of friends decided to return to São Miguel do Passa Quatro - GO on the 3rdof April, 2016. This time we were in eight motorcycles totalling thirteen people. This ride is done over a beautiful stretch of roads totalling around 200 kilometers. My bike had an excelent consumption output, reaching the mark of 33 km per litre (I was riding in a speed bracket of 90 to 110 km/hour). 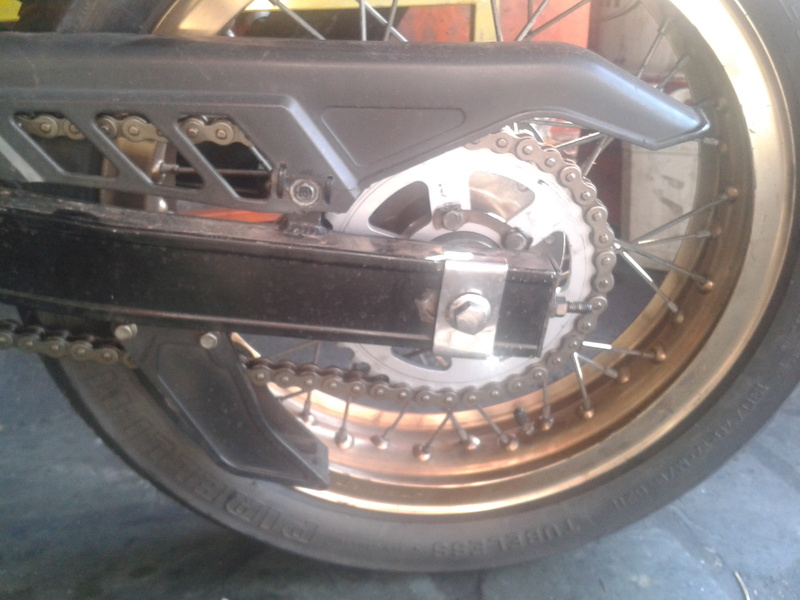 On the 5th of April, 2016 I decided to change my bike's transmission (sprocket, rear sprocket and chain drive). The last time I did that was by July, 2012. It is worth mentioning that these components last around 30.000 km ridden since that date. Bom Jardim - MT - 2016 - it isn't Bonito - MS, but it is Beautiful! It has been a while since I did my last trip, and I was missing going for the big outdoors far from the urban traffic. I was dreaming of going to the outback of the State of Mato Grosso. Recently when surfing on the Internet I came accross the region of Nobres - MT, more precisely with the district of Bom Jardim - MT. This region, with its many natural attractions is becoming a tourism hot spot (and has being compared with the region of Bonito - MS, already well known by Brazilians and foreigners. We left Goiânia - GO on Wednesday, the 20th of April, 2016 by 06:30 AM having as our target the town of Campo Verde - MT. This town is located at the Southeast of Mato Grosso State, in the micro-region of Primavera do Leste - MT, and has its economy based on the agribusiness. 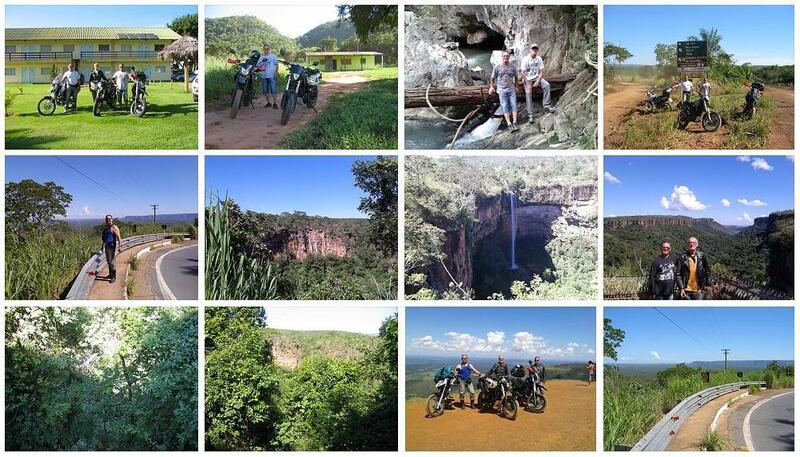 This trip allowed me to return to the Chapada dos Guimarães region again, where I have been previously by the end of May / beginning of June, 2011. 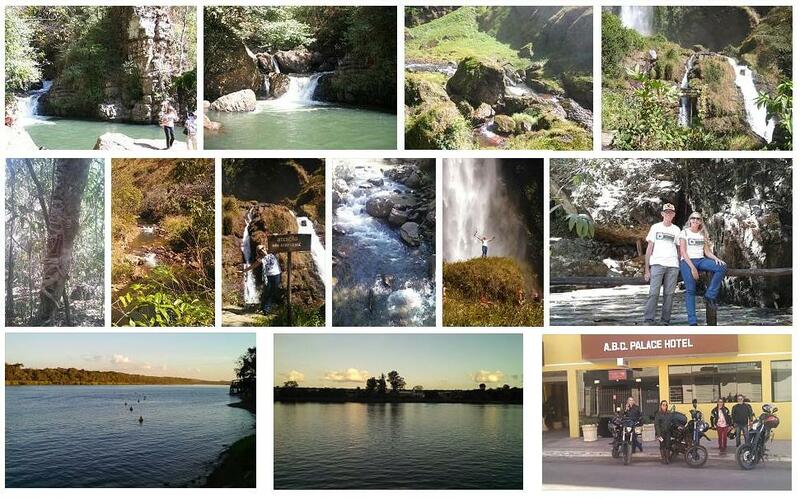 In reality my aim was to get to know the region of Bom Jardim - MT before the tourism gets to explored. And thus appreciate Mother Nature in the region while it is in its primitive state yet. My friends Renato (Yamaha Crosser 150cc) and Toninho (Yamaha XTZ-X 250cc) were the companions on this adventure; as usual I was riding my Sundown STX Motard 200cc. During this trip my motorcycle surpass the 70.000 km mark, ridden from May, 2008, from which more than 52.000 km ridden on trips. I consider this mark as a highlight for a bike of Chinese origin, a small motorcycle of only 200cc. As I already knew that we would be travelling in a region with sparse resources regarding petrol stations I did a refuelling schedule with intervals of approximately 200 km apart. The great majority of my friends that realize those rides and trips with me have two, or even three motorcycles at their disposal (even big bikes). I follow them (or they follow me) riding my Sundown STX Motard 200cc. Lately, all of them, are opting to ride their small motorcycles in all outings we do with our bikes. This is due to our age, but principally due to our personal preference for small motorcycles. And in this way I have being having a good output/performance of my bike, and principally a good and economic drive. 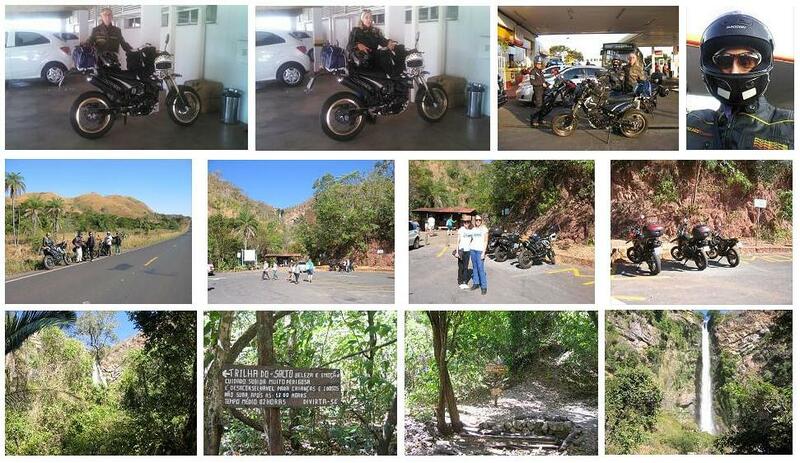 Lately I have utilized my motorcycle mostly on trips and rides, going for the open outdoors. The urban traffic in Goiânia became intense, and consequently not very friendly to motorcyclists anymore as used to be years ago. 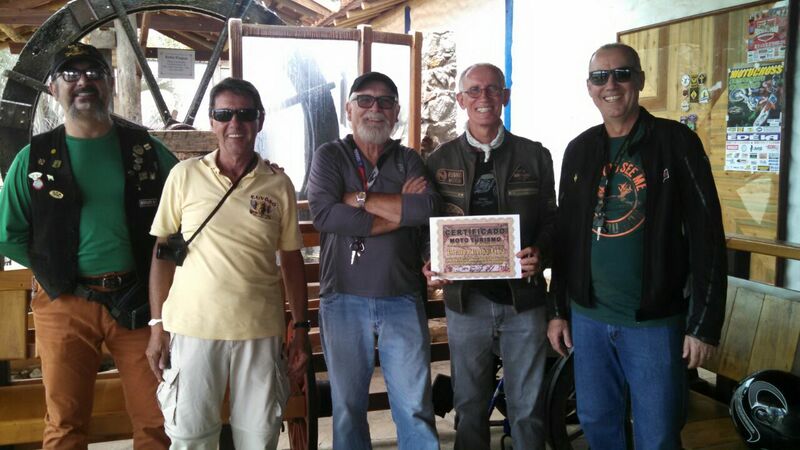 This was a great trip, due to the route and principally due to the friends that came along with me. We rode 2.121 km between the 20th and the 24th of April, 2016. My bike had a consumption of 66,85 litre of gasoline, wich resulted in an excelent average of 31,72 km/litre. My Sundown STX Motard on the 1st of May, 2016. Eight years on roads, 71.697 km ridden from which 52.416 km on rides and trips. This is the Chinese that knows more of Brazil. On Sunday, the 15th of May, 2016 - we reunited a group of friends in order to go on a short ride through the following route: Goiânia - Trindade - Goianira - Brazabrantes - Nova Veneza - Nerópolis - and returning to Goiânia - GO. It was a very pleasant ride, due to the weather that was mild. The roads were fairly empty. Our group was on the following bikes: Honda NC 700, Kawasaki Versys 650, Honda CB 500X, Yamaha XTZ-X 250 (two), Sundown STX Motard 200, and Yamaha Crosser 150. Our ride was around 120 km long. On the 5th of June, 2016 I went with Theresa and some friends of our group to Olhos D'Água (district of Alexânia - GO) in order to visit the traditional Feira do Troca, this time in its 86th edition; this was a short ride totalling around 280 km ridden. Some friends had talked with us about the Restaurante Empório Casarão (Restaurant Emporium Casarão) located at Cezarina - GO - BRAZIL, at the margin of the BR-060 road. On Sunday, the 26th of June, 2016 - we reunited a group of friends and took the road towards this location. We had a magnificent day! On the afternoon of the 22nd of July, 2016 I left Goiânia - GO heading for Formosa - GO. 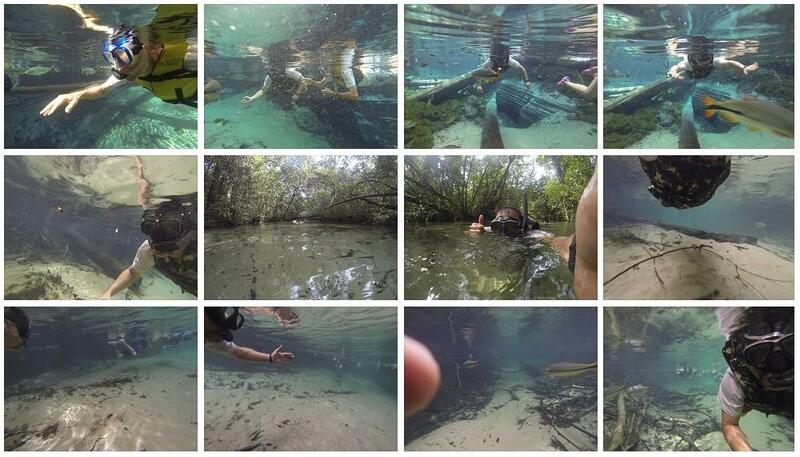 There were six people in our group (me, Theresa, Mauro and Célia, and Toninho and Salma). On Saturday morning we went to Salto do Itiquira (Itiquira Fall); by the afternoon the same day we returned to Formosa - GO. Next day, Sunday morning, we left to Brasília - D.F. 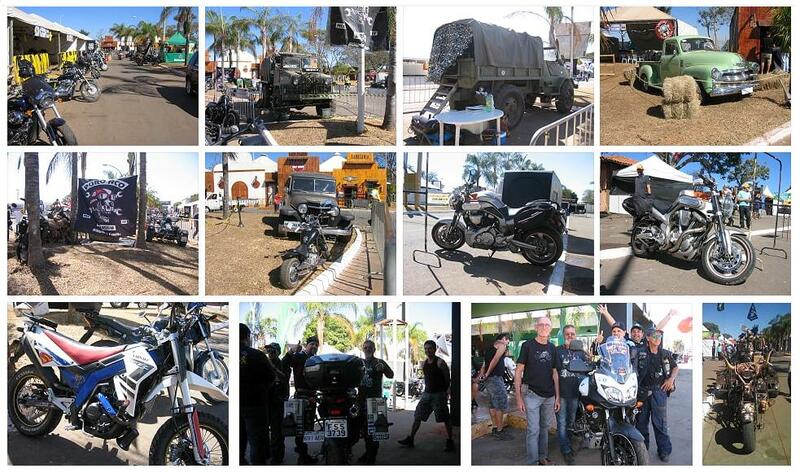 in order to visit the huge motorcycling event: Brasília Capital Moto Week, at Granja do Torto Exhibition Grounds. We returned to Goiânia - GO the same day by the afternoon, with a stop for lunch at Jerivá Restaurant located in Abadiânia - GO. Our round trip totalled 695 km. This was a wonderful opportunity to put our bikes on road again. It's interesting to mention that in this trip my motorcycle produced the excelent average of 33,18 km/litre, both ways. I perceived this yield as being the result of a complete carburator cleaning that was done fifteen days ago. And the replacement of the original carburator collector that had some cracks. This procedure made the motor return to the original pattern - working without oscilations when iddle (engine idling speed), at the mark of 1500 ± 100 rpm. 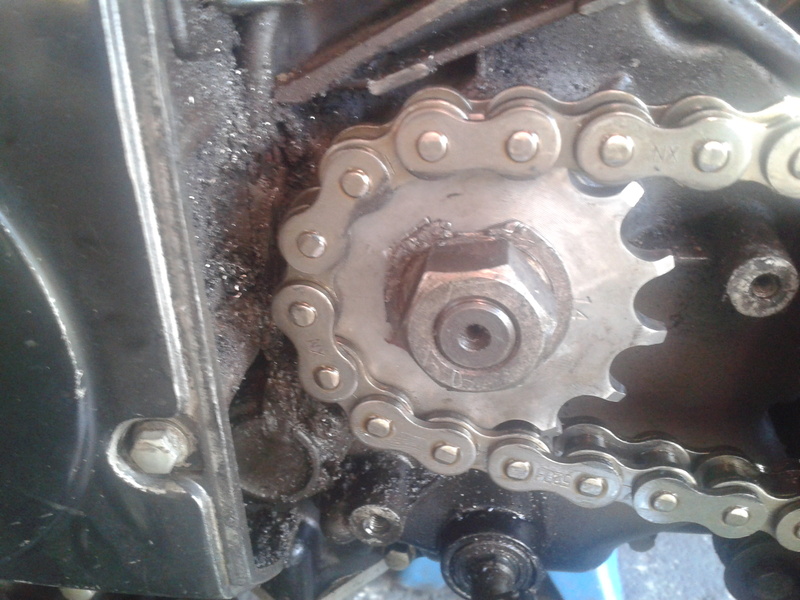 From this last trip onwards I noticed that my bike's engine begun to make a different noise. Paying attention to it, and talking with my motorcycle's mechanic we came to the conclusion that the noise was produced by the connecting rod. 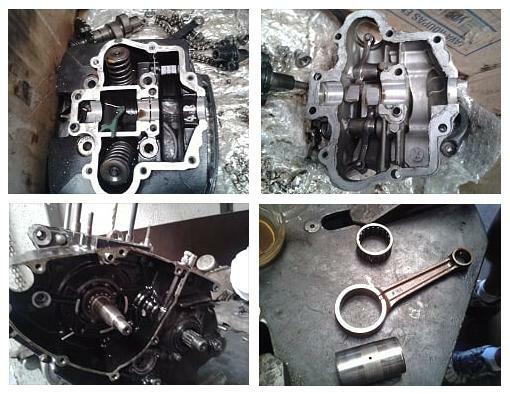 Images of the internal parts of my Sundown STX Motard engine, on the 6th of August, 2016. 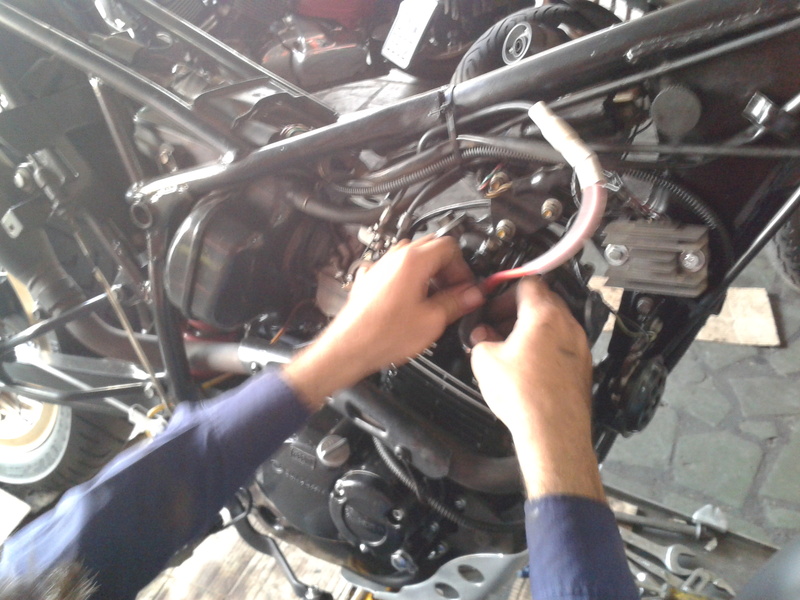 The engine was opened and we became sure of the need of the connecting rod kit replacement. I ordered a new kit on the Internet, and the replacement was made. The engine of my motorcycle has now clocked around 75.000 km. After opening the engine we realized that the voltage stator was faulty on the wiring and there was a need to replace it as well. Image of the connecting rod kit and the new voltage stator of my Sundown STX Motard, on the 6th of August, 2016. The new stator we installed is the original part of the Suzuki Intruder 250, in conjunction with the rectifier that I installed last year (a Suzuki Intruder 250 original part as well) certainly will work better than my bike's original parts (Made in China). Principally due to the fact that the original stator that came installed in my bike had been already re-wired with a thicker and better wiring some years ago (in July, 2011), and utilized in the last five years. I hope that this combination of original parts from the Suzuki Intruder 250 will work better in my bike's electrical system, producing a stronger electrical output to the whole system. On the 21st of August, 2016 we did a short ride, which was made shorter by a strong rain. We were at Pedra Branca Restaurant, on the BR-153 road, located close to Hidrolândia - GO. When we left the restaurant to go towards Goiatuba - GO we had to interrupt the ride and return to Goiânia - GO, due to the heavy rain that downpoured. Taking advantage of the 7th of September holiday (Brazil Independence Day) we did a relaxing short ride (totalling around 200 km), over a very well known route for us. There was some time that I had been noticing my bike's front wheel with a strange functioning, a kind of harsh rolling of the front axle. In reality I already known that the pair of front wheel bearings, still the original ones, needed a replacement after 74.000 km ridden. So, on the 20th of September, 2016 I took my motorcycle to the mechanic and I had the front bearings changed/replaced by new ones; and I had the accelerator cable changed as well. In order to have a better performance of the accelerator cable system I eliminated the return cable, and kept only the main cable. In this way the acceleration system now works lighter and better. The return is provided by the springs of the system. On the 1st of October, 2016, we did a ride with a group of friends in order to commemorate my 65th birthday. We took the BR-060 road to Cezarina - GO to lunch at Casarão Restaurant, a very pleasante spot on that road. From left: Renato, Mauro, Paulo, me, and my brother Irom. 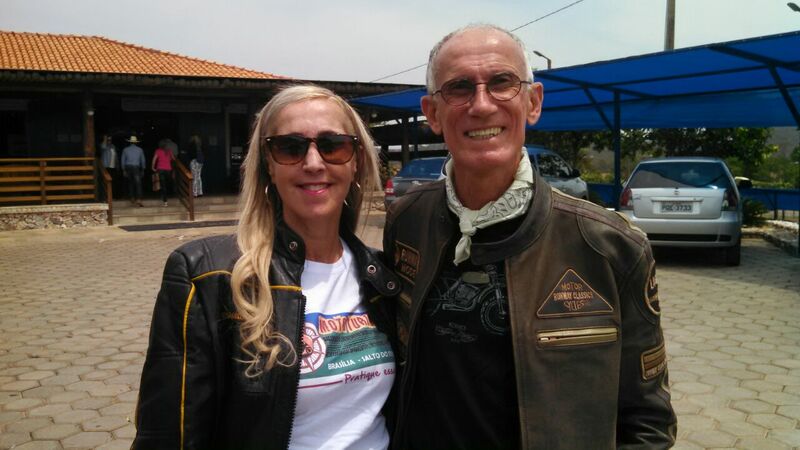 Theresa and me at the parking area of Casarão Restaurant. Every opportunity we have to realize a ride or short trip we take it. We take those occasions as a motif to hit the road. On Sunday, the 20th of November, 2016 we went to Bela Vista de Goiás, then to Piracanjuba - GO where we had lunch, and then we went back to Goiânia - GO, via the BR-153 road. Heading towards Piracanjuba - GO in the morning of the 20th of November, 2016. As a tradition, every year we do a ride to say our farewell to the year ending and to welcome the new year coming next. This year our short trip happened on Sunday, the 11th of December, 2016. 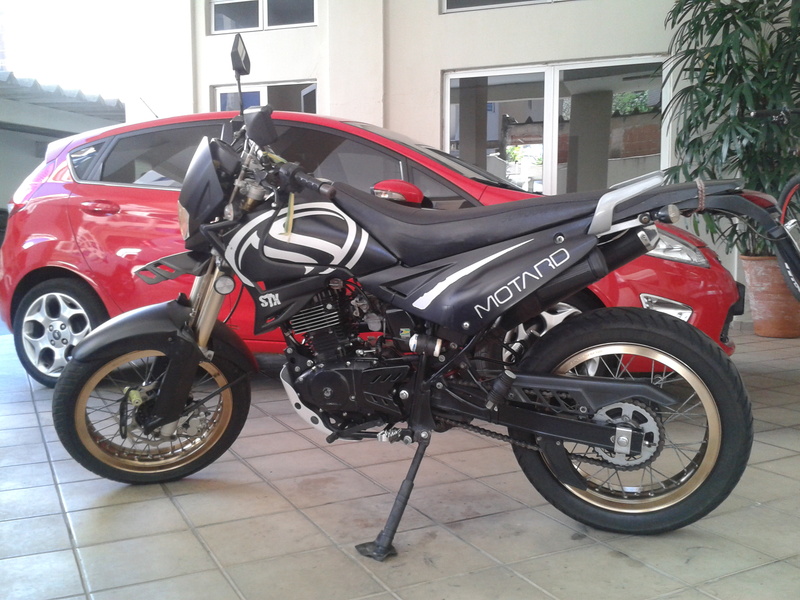 My Sundown STX Motard totalled 75.150 km ridden at the end of the abovementioned ride. I have been observing that my bike's performance is very stable. Riding within the bracket ranging from 90 to 110 km/h I could get an average of 31,36 km/litre. So this reassure that my decision to make the connecting rod kit replacement was the right one.